They are low in calories and fat, while packed with essential vitamins and minerals. Especially zinc! 6 medium oysters = 220% daily value. Atlantic / East Coast native (Crassostrea virginica), Olympia / West Coast native (Ostrea lurida), Pacific / West Coast non-native (Crassostrea gigas), Kumamoto (Crassostrea sikamea), and European Native / Flat (Ostrea edulis). There are many others in the world. Different water and species result in different tastes. Growing method and age also influence the oyster’s texture. There are briny and mild, petite and XXL East and West Coast oysters. It depend on the farm’s proximity to the ocean and your proximity to the farm. 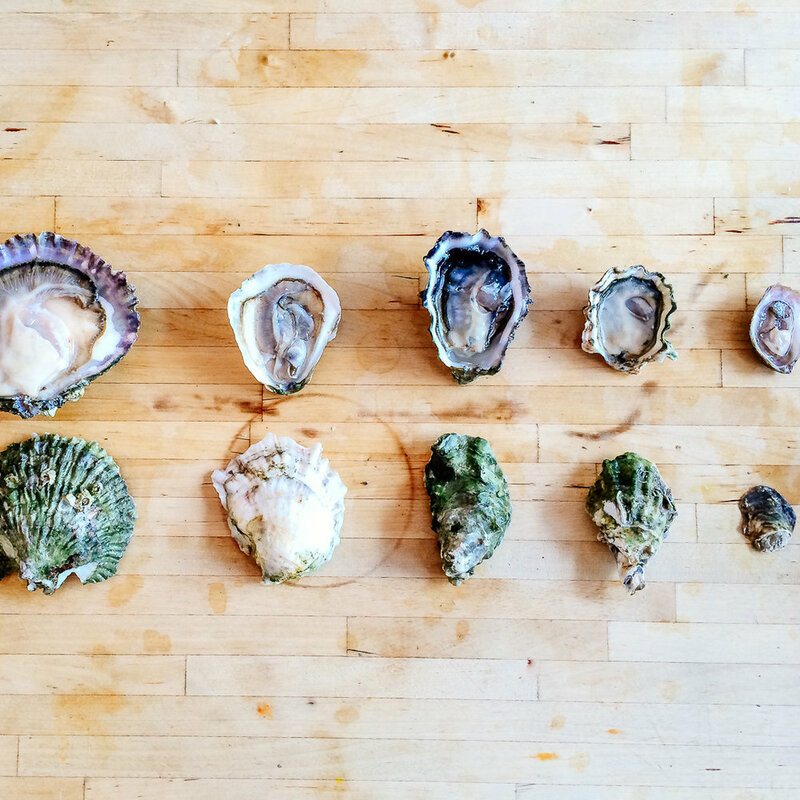 Generally speaking, Pacific oysters will have a pronounced cucumber or vegetal undertone. Atlantics are more prone to take on earthy, mushroomy, and molluscy notes. 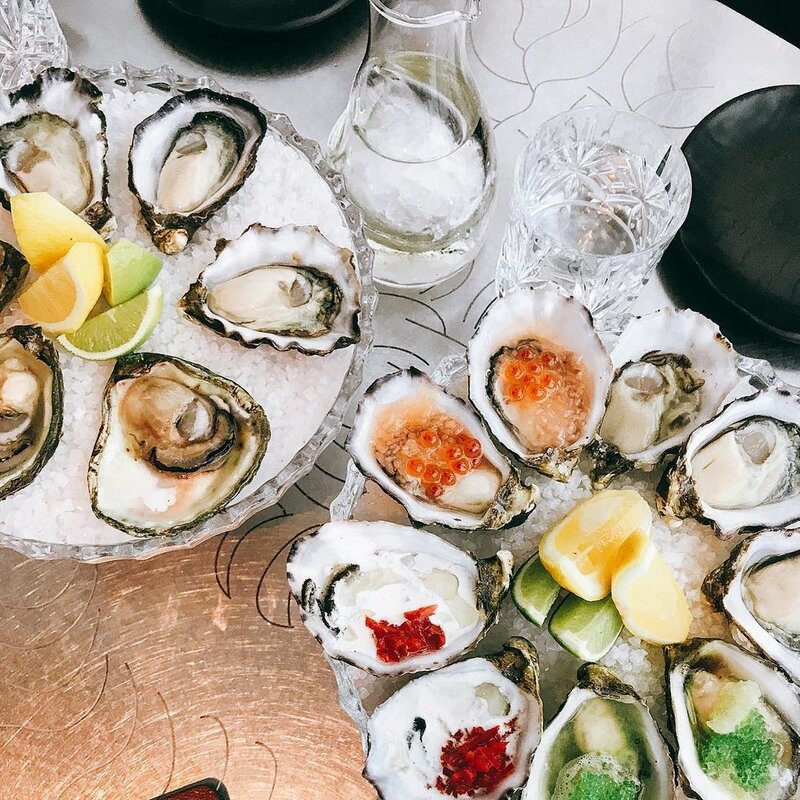 Texturally, East Coast oysters tend to be solid bites—silky to meatier, whereas West Coast will be slightly creamier, custardy. It’s fun to order oysters from all over the map, but also interesting to order different oysters from one region and compare the nuances. There is a WORLD of difference between a fresh oyster and a not-so-fresh oyster. Prioritize freshness over all else and you’ll have a great experience every time. Ask the server or supplier; request to the shellfish tag if necessary. Fresh oysters should appear well-hydrated with sea water, so toss dry oysters that stick to their shells. Freshwater will kill them. You want to eat your oysters alive! Experienced oyster shuckers will take care to remove grit, toss bad oysters, and leave the meat fully intact. All vital for optimal oyster enjoyment. See Standards. SEE: Feast with your eyes! Study the shell, shape, color. SMELL: It should smell sea-breezy and sweet, not fishy at all. SIP: Sip the oyster liquor to get a sense of the salinity. 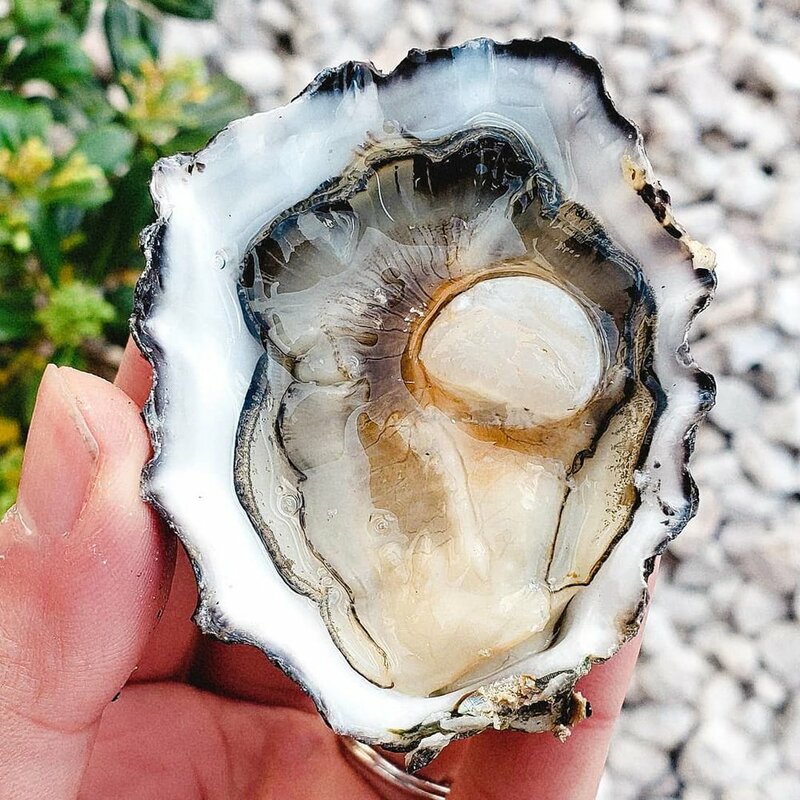 SLURP: Shimmy the oyster meat loose, tilt the flat edge of the shell to your lips and slurp! Don’t discard the oyster liquor (faux pas). SAVOR: Chew a few times to get the full body taste; notice the progression from nose (salty) to body (sweet/flavors) to finish (lingering aroma). SHELL: Flip the shell over and admire the collaboration between nature & farmer. Light-bodied, crisp, dry white wines and chilled chardonnay-based champagnes. Muscadet, Chablis, and Sancerre can be magnificent choices. The trick is to match the acidity of the wine to the brininess of the oyster. Crisp lagers and pilsners, hoppy IPA’s with a kick, or a light, smooth stouts (Guinness!). There are also a couple oyster stouts out there made with real oysters… might be worth a shot. 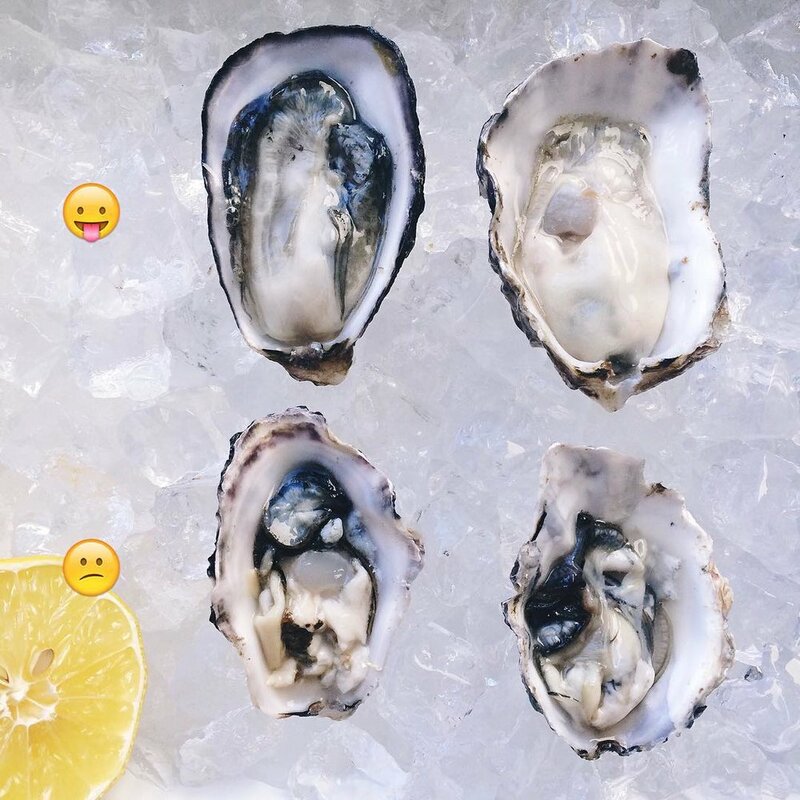 Sip a little of your beverage of choice, then eat the oyster. Make sure you chew the meat! Take another sip. Let them flavors meld and decide whether the two are synergistic, neutral, or combative. Get yourself an oyster knife. Shuck on a flat surface. Have a glove or kitchen towel to protect your hand. Shimmy the knife blade, pointed down, into the hinge until it feels secured. Twist/torque the knife, like turning a doorknob, to pop open the shell. Don’t pry up and down. If the hinge is obscured or busted, push the tip of the blade into the right edge where the adductor muscle is attached. Slide the blade across the top inside shell to sever the adductor muscle. Remove top shell. Then slide your knife under the bottom adductor muscle to dislodge it entirely. Shucking a clean oyster takes practice. One trick is to turn the oyster over in its shell so that the bottom belly is up. Remove all broken shell or grit with tip of your knife. Watch my video on How to Shuck. Although I prefer my oysters “naked,” toppings can add a wonderful dimension to oysters if done in moderation. Try a classic red wine vinegar & shallot mignonette, a drizzle of lemon, or a pinch of freshly grounded black pepper. But not all at once. A squeeze of lemon for a large Belon is all you need. Don’t you dare put anything on the Olympia. Try ponzu with green onion, creme fraiche & American hackleback caviar (my favorite decadent treat), lime and grated ginger. Don’t cover your oyster with too much as will overpower the natural taste. This tends to happen easily with cocktail sauce or horseradish. What’s the point in doing that? 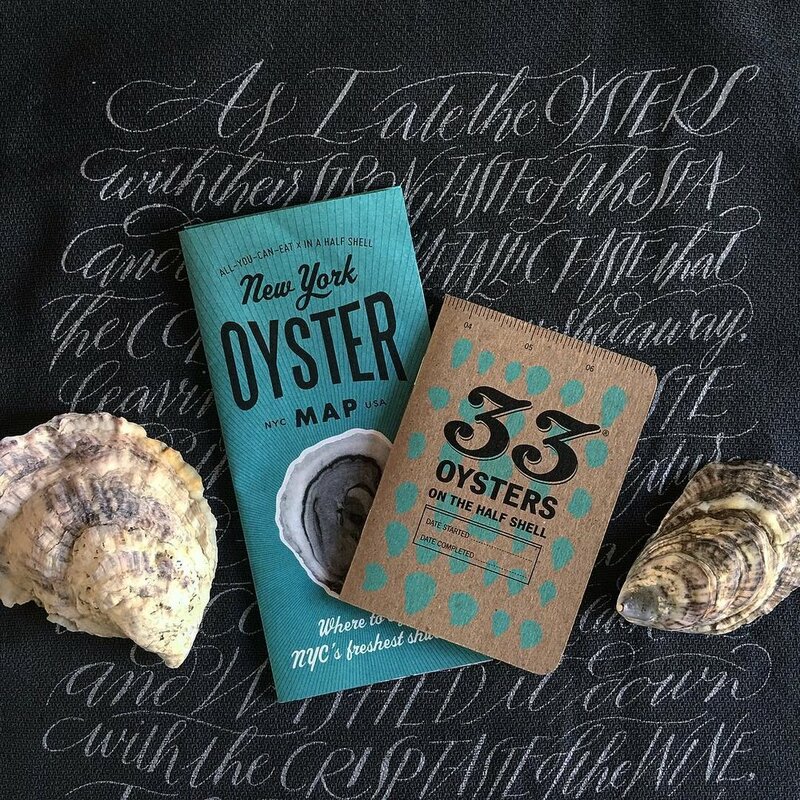 Sign up for my Oyster Mastery class on Skillshare!